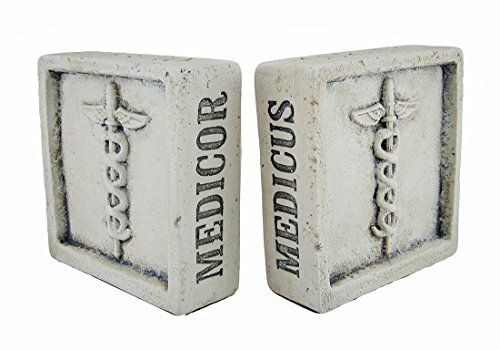 This pair of bookends features debossed Latin medical terms for heal, doctor and curing on the sides and a caduceus symbol on the front. Made from cement, they're sure to hold up those heavy medical books! Each 7.5 inch high, 7.5 inch long, 3 inch wide (19 X 19 X 8 cm) museum white bookend has a textured rustic finish for an aged effect. This bookend set makes a great gift for those in the medical field sure to be admired!